If you're like me, you've kept an eye on Josef Centeno over the past few years. The Chef first made a name for himself around these parts when he was doing his multi-course tastings at Opus back in '06. He left there in January 2008 though, and spent some time planning his own place, Volver, before taking over the kitchen at Lot 1 in Echo Park. The partnership ultimately ended up disastrously, and Centeno largely stayed out of the public eye until late 2009. That was when he joined forces with Michael Cardenas to open Lazy Ox Canteen, which was sort of the first step on his real return to LA dining. 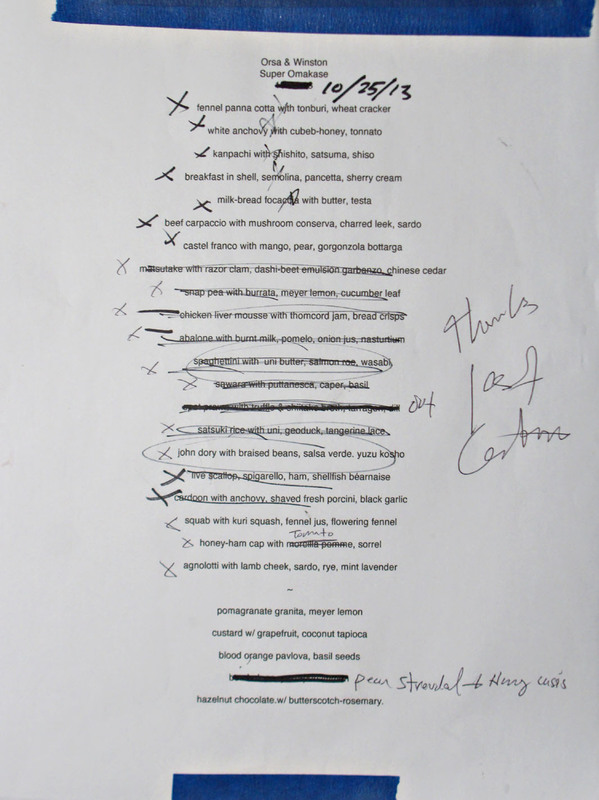 The accolades garnered there allowed the Chef to open Bäco Mercat in late 2011, and then Bar Amá a year later. However, Baco and Ama are decidedly casual affairs, and all this time, Centeno was still yearning to get back into something a bit schmancier. The result of this latent desire manifested itself in the form of Orsa & Winston, the restaurant that he wanted to do post-Opus, but couldn't. Named after the Chef's two dogs, it's located right next door to Bar Amá, and features cooking inspired by the culinary traditions of both Japan and Italy. O&W debuted on September 24th via a special MasterCard promotion, and opened to the public shortly afterward. Centeno is joined here by Director of Operations Mike Hoagland, GM/Wine Director Sally Kim, Pastry Chef Isa Fabro, and Sous Chefs Joel Stovell and Susan Yoon. Orsa & Winston is small, comprising roughly 1500sqft between both the dining room and the kitchen. The roughly 34-seat space was penned by Amaryllis Knight of ALTAI Studio and showcases a pretty subtle aesthetic, a fitting canvas for the food I guess. The best seats in the house are, unsurprisingly, situated at the four-seater, Caesarstone-topped counter (reminiscent of the one in my own kitchen), which affords diners a view of the hustle and bustle of the gleaming, open kitchen. As far as Orsa & Winston's menu goes, there are a lot of options here. Starting at the top, we opted for the roughly 25-course "Super-Omakase," priced at $195 per head and which is only available at the bar with prior reservation. There's also the standard nine-course Omakase at $95, a five-course tasting at $60, a family-style four-courser at $50, and if that wasn't enough, even a few limited à la carte selections as well. Now, for the tipple, Sally Kim's in charge of the beverage program, which includes a well-curated wine list and a smattering of beers and sakes. 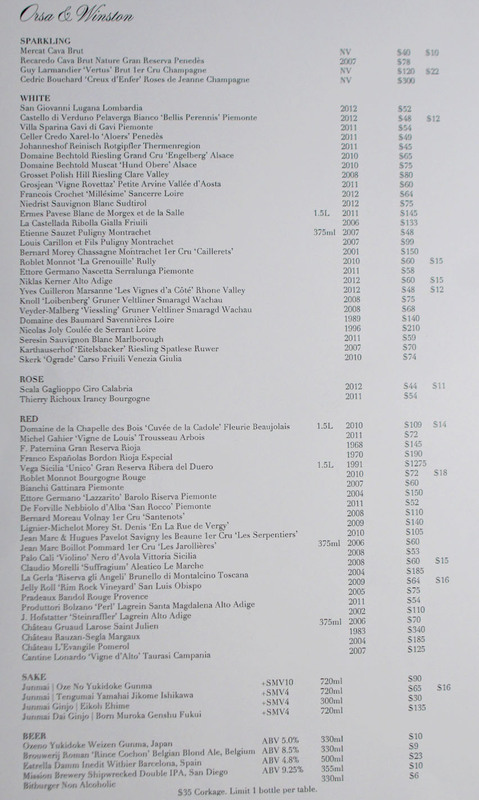 Corkage is set at $35, with a one bottle limit, a recent change from the $25/two bottle limit policy they had not too long ago. Click for larger versions. 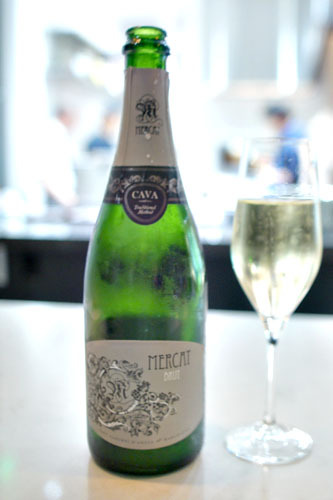 We ended up purchasing a fun bottle from the list to start things off, the Mercat Cava Brut NV [$40]. This was an easy-drinking, though not particularly contemplative sparkler, full of lemon and stone fruit, yet balanced with a dry, yeasty character to it. A tasty way to kick things off. 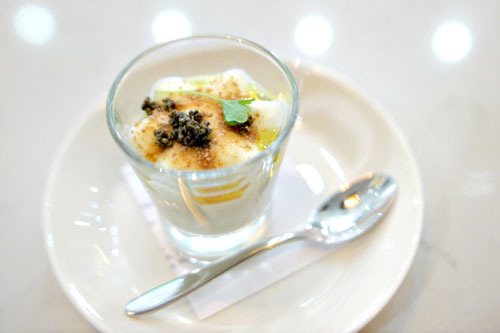 Serving as a sort of amuse bouche was a fennel panna cotta with potato-leek mousse, mountain caviar, and wheat cracker crumbles. Think creamy, herbal, and anise-laced flavors, leading to a muted sweetness, all set off by the countering crunch of the tonburi. 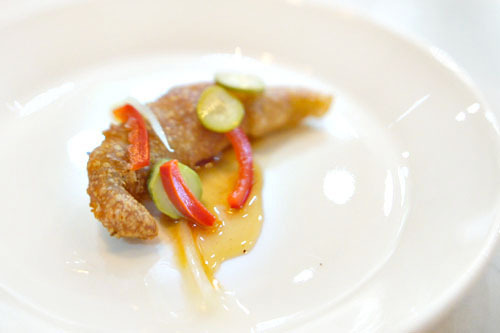 Next was Centeno's delectable take on the tapas dish boquerones fritos, the anchovy's fishiness leading to a sweet, spicy, lingering midpalate, with the pickled yucca and pepper imparting a well-suited brightness to things. I could've used a whole plate of these. Amberjack arrived with a quartet of Japanese accompaniments, its brine transitioning to an enduring, tangy sweetness tempered by the slight heat from the togarashi. 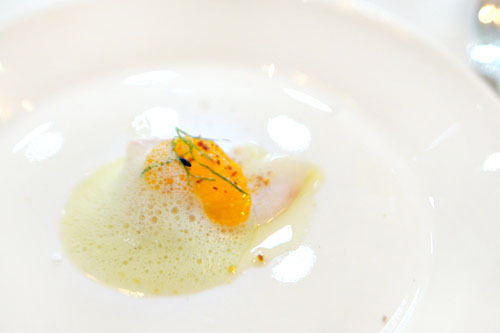 One of the favorites of the night was this homage to Alain Passard's legendary Arpège egg, which I found quite similar to Manresa's well-known version (recall, Centeno worked there as well). 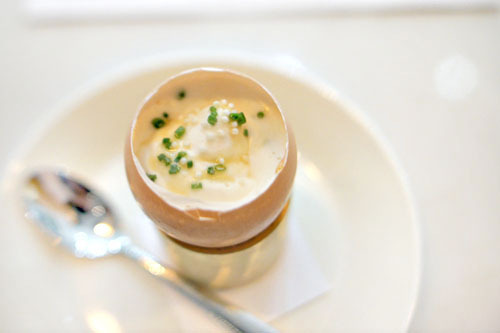 It was comprised of coddled egg, sherry vinegar, maple syrup, chive, and pancetta, with the creamy lushness of the egg gorgeously balanced by the tart and sweet notes present, while the lardons at the bottom added a wonderful hit of salt to the fray. Nice temperature contrast here, too. Orsa & Winston's bread course was another standout. 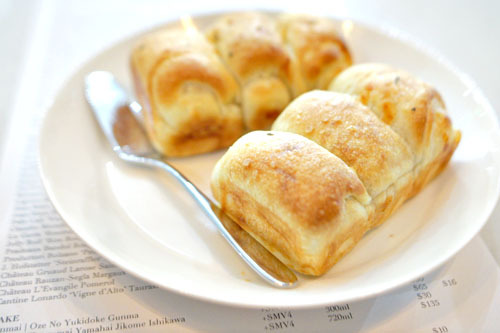 The bread itself ostensibly combines Japanese milk bread with focaccia from Baco Mercat, and was delicious on its own, a great blend of a crisp exterior and a silken center. The oregano butter that came with was super soft, and subtly herby, a fantastic accoutrement to the bread. Even better, though, were the slivers of pork testa with shiso and capers, which spent 12 hours in the oven. Herby, oily, slick, and unabashedly porcine, they formed an in-your-face blast of meaty goodness that complemented the bread in commendable fashion. 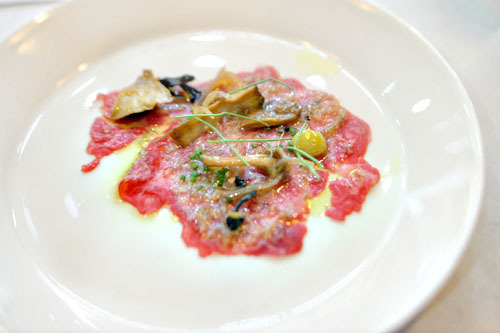 A carpaccio of American beef brought together pickled mushrooms, black truffle, Sardo, and Champagne raisins. The meat itself was slick and slippery, with an olive oil-y weight to it that served as a counterpoint to the herby, pickle-y qualities of the dish, all while the cheese imparted a great bit of saltiness to the mix. However, I really would've appreciated a knife here, so that I could've more easily cut the beef. Shreds of speckled Castelfranco paired well with Gorgonzola and mango, the delightfully bittersweet qualities of the radicchio working beautifully with the contrasting forces of sweet and salt present. Lovely crunch here, too. 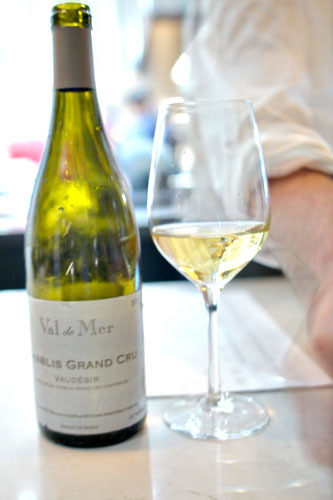 Two Burgundies were BYOB'd tonight, the first of which was the 2011 Val de Mer Chablis Grand Cru Vaudésir. I quite liked this one, its floral, grassy, slightly spicy qualities complemented by a mineral-y backbone and a certain roundness, which only increased with time in the glass. I'm a sucker for razor clams, so perhaps it's no surprise that this was probably my favorite course of the night. I loved the texture of the clams here, and their inherent salinity was faultlessly played against the smoky undercurrent present, with the beets imparting a certain brightness to the dish. Even better? The earthy, hefty garbanzos, which really grounded the dish. Cardoons were bright and crunchy, their slightly acerbic, vegetal savor working hand in hand along with the piquant tastes of the fermented garlic and anchovy combo, all while the porcini actually help moderate the dish. Very neat. 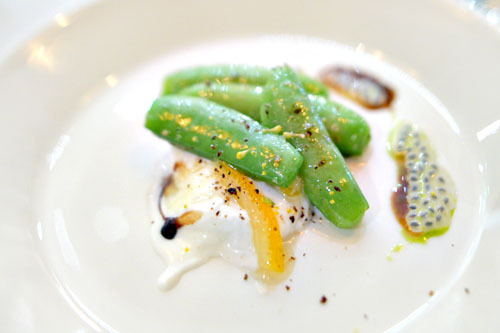 Another one of my favs was this presentation of sugar snap peas with burrata and meyer lemon marmalade. The vibrant, saccharine crunch of the peas was gorgeously conveyed here, really giving us a crystal clear picture of the veggie that was modulated by the lushness of the burrata, with the lemon contributing a sour accent piece to the course. 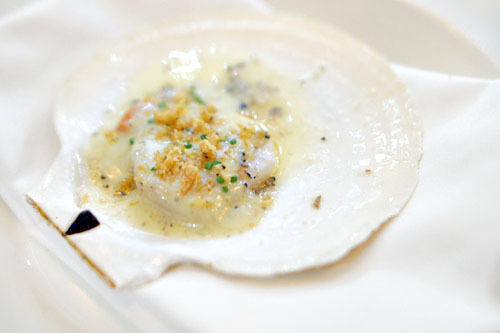 Live scallop was presented in situ, served with roe, butter, and a truffle béarnaise. 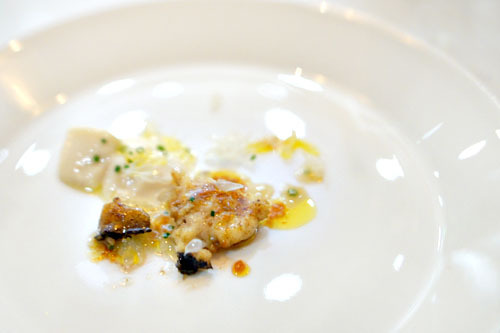 It was delicious, and one of the most luxurious preparations of the ingredient I've had, the butter and truffle really melding well together and adding a seldom seen layer of decadence to the bivalve. I loved the crispy breadcrumbs tossed on top as well, and I could've really used some more of that milk bread to sop up the remaining liquid! 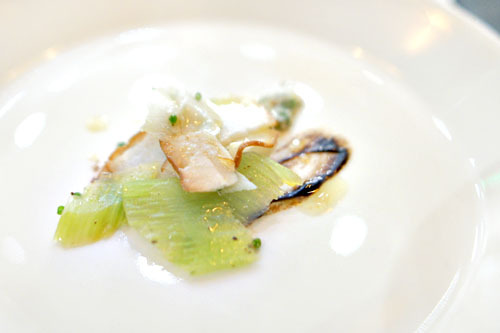 Abalone came with an intriguing burnt milk panna cotta, resulting in a sweet, smoky, almost vanilla ice cream-like sapor to go along with the pleasantly chewy bits of gastropod, interjected by pops of tartness from the pommelo vesicles. 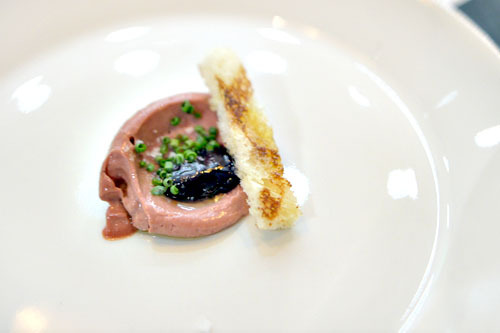 Chicken liver mousse arrived silky and smooth, imbued with its unmistakable, earthy musk. It was a fine presentation of the delicacy. However, the included thomcord jam verged on overly sugary, thus masking some of the liver's character. 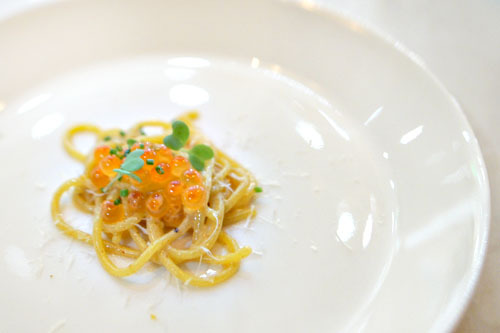 Pasta made its first appearance with this excellent course of spaghetti, done up with white soy and salmon roe. The noodles themselves were properly al dente, with the incorporation of yuzu and ikura giving up a zesty, piquant blast that made the dish instantly Japanese-y. I wouldn't have minded a whole plate of the stuff. Sawara is something I rarely get to enjoyed cooked, a shame, because here it was superb. 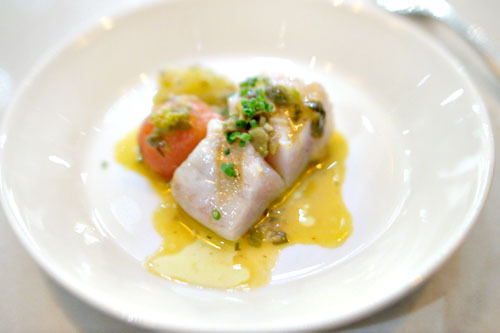 The Spanish mackerel itself was deftly prepared, with a satisfying texture and its signature salinity intact, but the key was that sugo alla puttanesca, which contributed a classic tomato-based, caper-laced counterweight that finished out the fish beautifully. Here, we had a risotto of sorts, but one made with Koshihikari from Uruguay I believe. 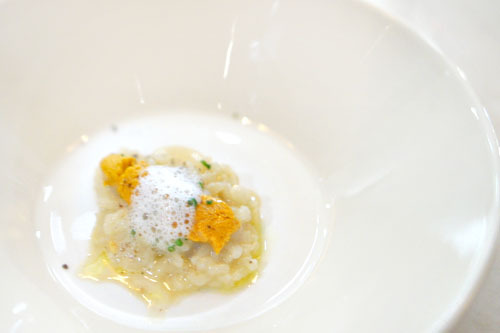 Think starchy and heady, with the heft of the Pecorino balanced by the sweet, tangy nuances in the rice, while the manila clam and urchin providing the expected ocean-y flavors. I wanted a larger bowl! 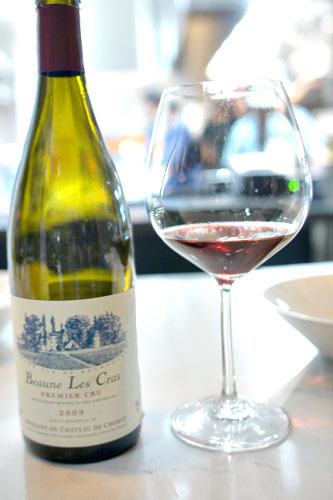 The second Burg came in the form of a 2009 Domaine du Château de Chorey Beaune 1er Cru Les Cras Vieilles Vignes. This one seemed very tight at first, without much in terms of aroma and a smoky-tannic nature with very little fruit. It did get more pleasing to me in time, though, with the cherried qualities and minerality coming through more and more. The Dory was another highlight for me. 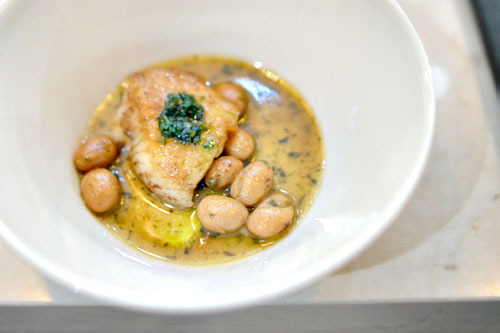 The fish was cooked perfectly, with a fantastic bit of crust and a great depth of savor that was expertly paired with the citrus-y, herb-y notes present, while the beans added a great heft and texture to things. Squab had a delightful char on it, which imparted a bitter savor that worked in harmony with the immensely satisfying slices of the bird. The use of red curry and fennel imparted further facets to the course, but the squash went overly saccharine, distracting me from the other great things going on here. I would've liked something more astringent, vegetal to go along. Ham cap was just brimming with porcine richness, a commingling of lean and fat that was squelched in part by the sugary honey and tart tomato jam. However, I really needed a bigger piece here, so that I could've better appreciated the textures and body of the meat. 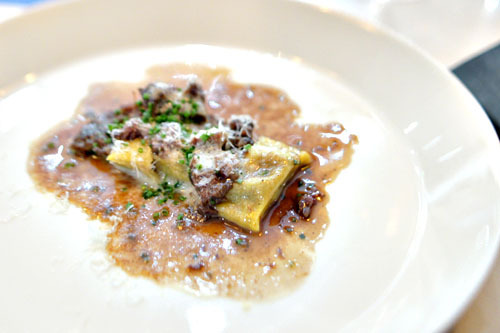 Our final savory course of the night was also our most substantial: an Okinawan potato agnolotti stuffed with braised lamb cheek. The tender shards of meat showed off all the deep, dark flavors that you'd expect, but once again, I found the sweetness here a bit too strong. Satisfying in a straightforward manner. 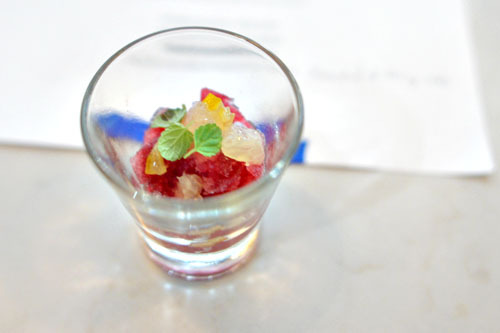 A pomegranate granité with lavender and meyer lemon served as a very smart intermezzo, its fruity, floral, minty qualities working as an effective palate cleanser after the heavier coursed that preceded it. 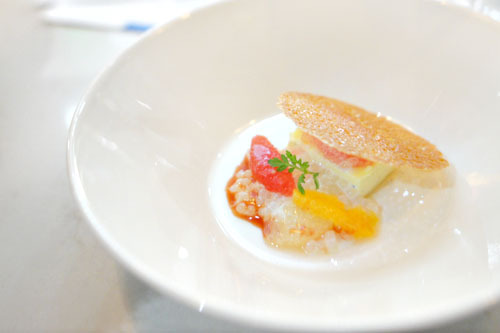 Next, vanilla custard was joined by coconut tapioca, blood orange caramel, and a grapefruit granita, the vanilla and coconut forming a great combination that did a nice job playing off each other, with the caramel and grapefruit forming a sugary sweet base to the dessert. Lovely crunch here from the tuile, too. A blood orange pavlova was superb, the bittersweet, aromatic nuances from the citrus-basil interplay wonderfully tempered by the light crunch of that meringue. 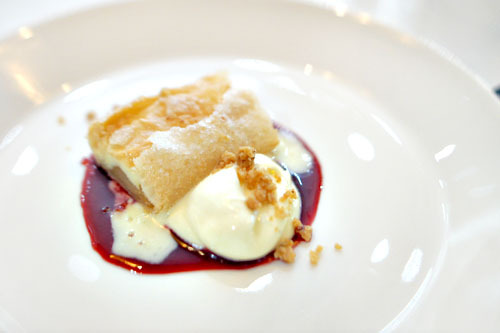 My favorite of the desserts was the pear-ricotta strudel with honey, cassis, and brown butter streusel. The key here was how the initial sweet-n-spicy flavors transitioned to the clean, crisp essence of pear, with the savory crust and brown butter coming in toward the end. 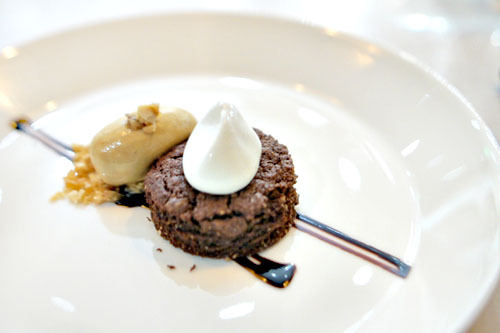 The requisite chocolate dessert brought us a hazelnut-chocolate cake topped with whipped crème fraîche, with butterscotch, rosemary, and a hazelnut toffee. Think your classic chocolate-hazelnut flavors here, but greatly enhanced by the butterscotch and toffee, with the rosemary adding a fantastic aromatic component that really tied everything together. 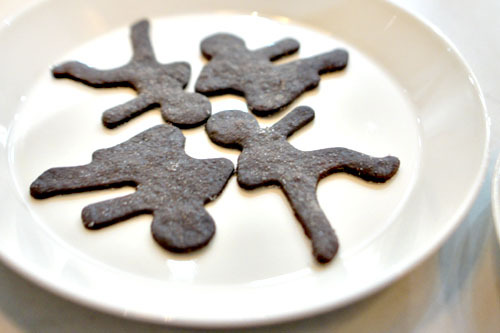 To close: fun "ninja-bread" men: a new school look, old school cookie taste. I think we've all been keeping tabs on what Josef Centeno's been up to these past few years, and it was great to see the Chef finally back in the kitchen, cooking in a smaller format and in a style that better makes use of his classical training and fine dining background. Orsa & Winston's one of the most exciting debuts of the year, but the food here is somewhat difficult to classify succinctly. It does draw from both Italy and Japan as advertised, and has a certain quiet thoughtfulness to it that I can't quite put my finger on. The flavors were very intentional, yet fine-drawn, with a sort of ingredient-centric quality about the plates, and I'm not sure if I've had anything quite like it before. Service, meanwhile, was as on point as you'd expect, and I'd be curious about trying some of the other menu options as well, though at the same time, I'm thinking that perhaps the place should cut down on the number of ways to dine, which currently stands at five (Super Omakase, nine-course, five-course, four-course family-style, à la carte). One last thing: I'd also like to see more variation in the dishware used, as seeing the same plate over 20 courses does get a tad monotonous. As always, thank you for the thoughtful review. A warning to the diner planning on bringing a birthday cake to the restaurant, they charge a $8 plate fee. Thanks for this review, I'm planning to go for the 5 courser some day. 20+ course is just too much for me! Anon: You're quite welcome. A cake cutting fee is pretty common though, right? Matt: Why not split the difference and go for the nine? 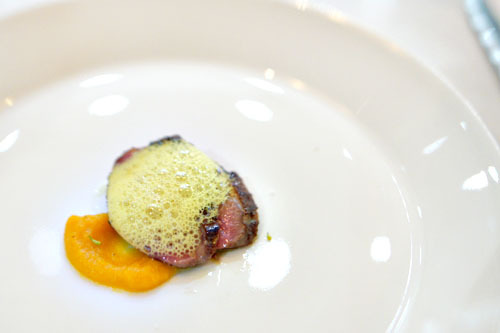 Perhaps this isn't entirely kosher, but, if pressed, would you say the dining experience at Orsa & Winston is comparable in quality to those you've had in SF at Atelier Crenn, Benu, etc...? 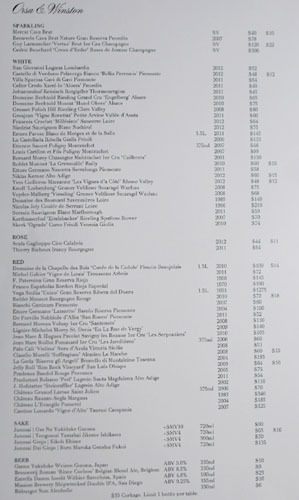 that wine list is so awful (and overpriced) especially when attached to an equally awful corkage policy. How can you serve such great looking food and care so little about the wine. If I have one more hipster somm at a new restaurant tell me to try a wine and say "it's made in an oxidized nature" , "very high piercing acidity" , "organic, biodynamic" I will throw my wine glass at them. Anon: No need to bring the kashrut into this. Unfortunately, I'm not sure if any place down here--O&W included--is quite up there with the best that SF has to offer (I'd include Saison in that grouping as well). What do you think sets the best of the SF places apart? More experienced chefs, better access to higher-quality ingredients, more freedom to play because of a more lenient customer base? I think a lot of people would say that we have superior ingredients down here, so it's not that. And I don't believe experience is necessarily lacking, either. I actually lean toward your third conjecture. 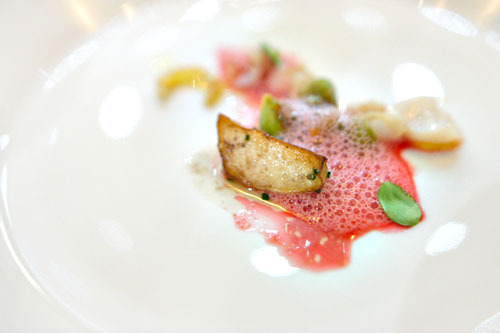 LA has never been a "fine dining" sort of city, so I don't think the populace here is as accepting of the 15+ course, $200+ degustations that you tend to find at the truly ambitious/avant garde places (my favorite way to dine, incidentally). 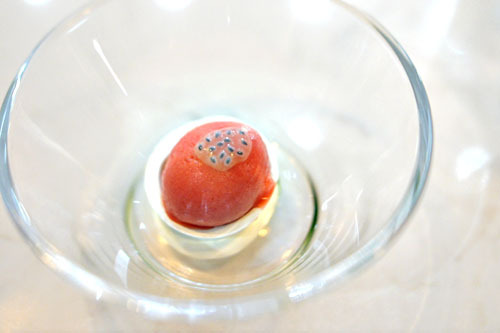 Hi Kevin - I had did the "super" omakase as well when I visited LA in the fall and had a similar opinion. It's off to a great start, but can obviously get better. 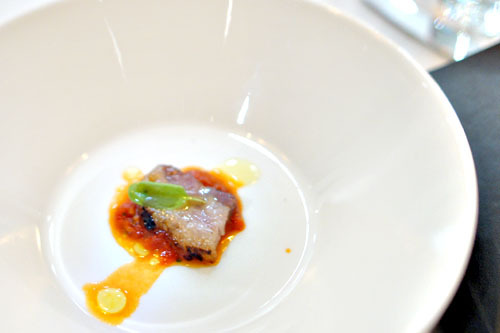 I would say maybe 20-25% of the courses were misses including a very dry pork dish. However, I don't normally care for bread, but the delicious bread course here was a little more unique and interesting. 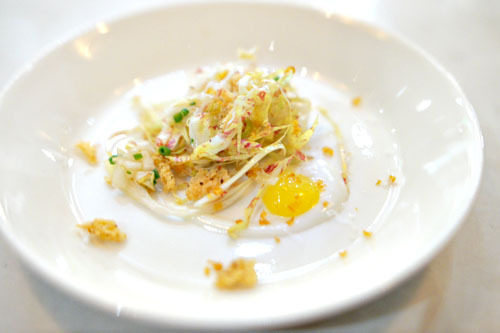 I went to Saison in December and it's operating at top 5-level restaurants in the US, easily. I also agree with your assessment about LA not really "into" 15+ course tastings. I feel if O&W didn't have so many other dining options (the 4 or 9-course, family-style, etc) and if they could just focus on the longer menu, it could be more refined. 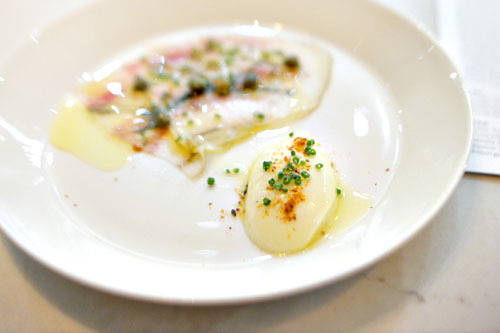 Saison, benu, Brooklyn Fare, Blanca, etc don't really have that issue and can just focus on one menu each night.